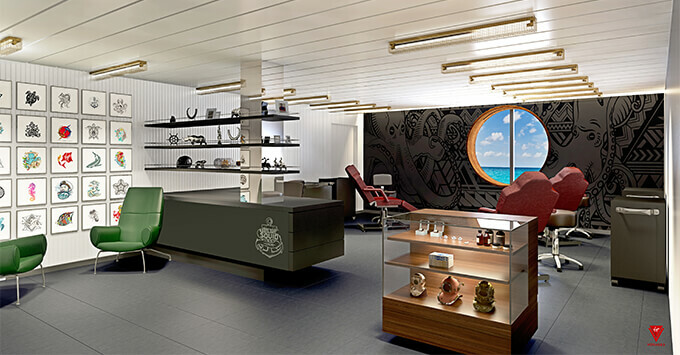 (9:38 a.m. EDT) -- One of the most anticipated cruise launches in the industry received a boost last week when Virgin Voyages announced that their first ship, Scarlet Lady, would have a tattoo studio onboard. 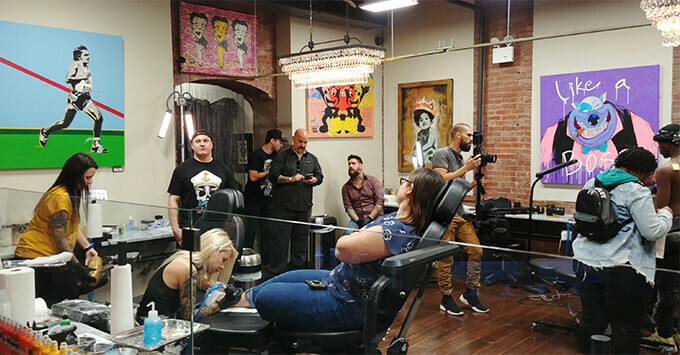 The announcement prompted Andrew Bryant, 26, to drive up to New York City on Saturday morning with his girlfriend from their Pennsylvania home to get a free tattoo at Soho Ink, a promotion sponsored by the new cruise line. Bryant saw the free ink as an early taste of the Virgin Voyages experience; he's had a deposit down for a sailing for just about one year. "When it comes to vacations, we cruise more than anything else," he told Cruise Critic, adding he's been on most of the mainstream cruise lines including Norwegian Cruise Line, Royal Caribbean, Carnival and Disney. "The first thing that caught our eyes [about Virgin Voyages] was the 18 and up… so we decided to give it a shot. The more information that's come out about it, the more excited we are about it." Bryant and his girlfriend, who he admits both have their "fair share of tattoos" were thrilled when they heard the ship was going to have the Squid Ink studio onboard. "You don't get that on any cruise ships that's out there… it's just cool." Inside Soho Ink, located on Lafayette Street in SoHo, the music blasted, free cupcakes were on offer and everyone sported multiple tattoos and piercings. (Cruise Critic attended not just an observer, but a participant, as Senior Editor Dori Saltzman received her own nautically-themed tattoo). While most of the crowd at the event were there for the free tattoo and showed little interest in actually sailing with Virgin Voyages, 20-something Bryant and his girlfriend seemed to fit the exact demographic most people think the line is going after. After all, isn't Virgin known for embracing the young, beautiful, hipster vibe -- tattoos and designer ripped jeans included? Not necessarily. "It has nothing to do with millennials," middle-aged Frank Weber, Virgin Voyages' senior vice president of hotel operations told Cruise Critic at the event. "I would be the one going on a Virgin Voyages cruise." A piece of Weber's upper arm quarter-sleeve tat peeked out from underneath his Virgin Voyages short sleeve T-shirt. "It's not really about demographics. It's about a mindset," he said. "We're looking for sailors who are looking for something new, something interesting … people who want to explore things and experience new things and don't want to go with the regular flow. "I'm not a millennial and I would definitely go on this cruise just because of the experience it will deliver… For me, I would go and get a tattoo, but that doesn't mean that all the other sailors on the ship are going to get a tattoo." Christina Baez, Virgin Voyages' public relations and events manager, echoed Weber, telling our editor that she -- a woman in her 40s who already had two tattoos inked over 20 years ago -- was the ideal client for the cruise line. But while being a millennial or getting -- or having -- a tattoo is not a pre-requisite for going on a Virgin Voyages cruise, the decision to put a tattoo studio on their ships is a bold move. For many people, the decision calls up the image of the younger hipster millennial -- and some long time deposit holders aren't having it. "Got the email yesterday and immediately cancelled our deposit reservation. Boxing Punchbags and Tattoos are really not our thing at all," wrote Cruise Critic member PederLin the day after the line announced Squid Ink. "I actually canceled my deposit," wrote Cruise Critic member eroller. "I think I'll sail on Virgin at some point, but so far nothing has appealed to me… I know I'll eventually sail on Scarlet Lady as the concept of an adult-only ship that is not a floating home really appeals to me. On the other side of the coin, do I really want to spend a week sailing with a bunch of Millennials? Probably not. That is not my cup of tea either." Whether Virgin Voyages is able to convince the larger cruise community that it is not just seeking millennials may not matter. Anyone who is turned off when the line makes an announcement like the Squid Ink tattoo studio probably indicates those people don't fit the Virgin mindset. And considering tattoo studios are now in glamorous areas with hefty price tags -- Soho Ink is surrounded by high-end boutiques and a custom design tat can cost thousands of dollars -- we're inclined to believe the line just might be on to something.